The very first water from the solar pump ran the other day and Tommie was there to see it. It's a very satisfying system because you can hear the energy of the sun as the pump has more or less power and you can "see" the sun by the volume of water in the stream, though much delayed. It was very cute. She immediately called up her brother (who took an interest in the project early on) and held the phone inside the pump house so he could hear the pump wind up with the sun (more power) and down with the clouds (less power)! The solar panels were cranking out 39.6 volts on a mostly clear November day, moving about 800-1000 gallons per hour. The solar pavilion on the far side of the main retention pond. It will pump almost twice this volume during the summer months. But there's no battery, so when there's no sun, there's no stream. Unless it's raining, in which case there's still quite a flow! Here's a little video of the first water running down the creek. Within a few days of getting the system finished, it rained. And hard. It's easy to forget that this project isn't about making a "water feature". It was about controlling the water because this property was flooding. Last year there was standing water all around the buildings and water running across the driveway. With the work we've done there are no longer an water issues. All excess water after being collected, running the stream, and filling the large 'variable edge' lined retention pond where it can over flow into a restored wetland with a modified outflow (we created a small dam with the glacial till we excavated from the main pond) allowing the wetland to fill up with almost 3' feet of water. Several hundred thousand gallons. water and the rest of the property had none. Perfect! Eckert Lyon restoration, pond, stream, wet land, solar pavilion, solar pump, restoration. A little add on to the solar pavilion was an enclosure for the pump. In all the design work dbBrad and Whidbey Sun and Wind did to get a maintenance/trouble free solar pump and structure, it never occurred to us that with a pump of this type needing to be primed, we would have a freezing issue. Insulating inside the permanent forms. This insulation's buried about 12" below the top of slab. It wasn't until we hooked the system for a trial run that I realized water stayed in the pump housing as well as the feeder line. Obviously it was going to need to be protected from freezing. Because I wanted a user friendly (no user required) system, turning valves, draining, priming, flipping switches, etc., wasn't an option. I used corrugated metal as the inner perma-form (non removable form). It's dark rust color will be better for insulation, absorption of the suns energy which will be stored in the 5" thick concrete walls and slab. So I did what I do. I gathered a bunch of recycled materials and built a pump house. We designed it to be earth bermed with passive solar heating using lots of insulated thermal mass with long overhangs to prevent over heating in the summer. The old metal window provides access. Matt finishing up the forms and getting ready to pour concrete. The only purchased item, 24 bags of concrete. The result is one stout little structure. Thermal mass was the objective. We needed to provide enough heat storage to keep the pump from freezing during cold spells. Here on Whidbey Island in Washington state, the weather is pretty mild. We do get snow occasionally but typically when it gets really cold, it's clear. Clear and Sun go together well in a passive solar scenario. The lower retention pond can be seen beyond with the hybrid steel-wood support for the solar arbor in the foreground and the pump house in the middle. The pump and the motor are separate pieces mounted together on a plate, all supplied by Sun Pumps. The wiring, plugs, and mechanics of the system were all provided by Whidbey Sun and Wind and went together great. The pond/stream design was by Fran Abel Landscape design and installed by DEW and the Pavilion and Passive solar pump house were designed and built by dbBrad. The how and the why of a solar pavilion! Matt and Brad carry the second solar panel towards the creek and pavilion. The first panel can be seen already mounted on the transparent membrane creating a covered outdoor space over by the creek. My project referrals keep unfolding leading to new projects, with Greenbelt Consulting connected me with these clients -- two wonderful people who have entrusted me to help them make their land right. The main pond was completed just this summer. When more funds are available we hope to finish planting with the help of Fran Abel Landscape Design. The plants shown were salvaged from areas where we excavated. On a piece of property at the bottom of a long slope from the Greenbank plateau down towards the west side of Whidbey Island, my clients had built a house and it had a serious water problem. Water flooded their land all last winter. The stream, looking good, not far after completion. Phase I was to regrade the topography so water could flow. Phase II was to collect the water and put it in a lined pond with an overflow area and get it operational as soon as possible. We are now in phase III, though the solar pavilion is a bit of an add on! The upper pond early on. Surface water and water from the residence are collected here. 15,000 gallons of water we pumped into the wetland this summer. Absorption was better than 1" per hour. except when we pumped the main pond this summer to patch a small hole in the liner! We dumped 15,000 gallons of water into the wetland and I was encouraged to see it able to absorb all of this water in less than 24 hours. Salvaged 5x5 treated fir posts with angle iron corners and pinned connection at top. Large retention pond and solar arbor site visible beyond hoops and perlins. Of coarse, during the winter it won't be able to absorb so much, so the wetland will get wetter -- way wetter -- and deeper! It's capacity is several hundred thousand gallons which I anticipate it will occasionally need. Most of this water will come via the stream that should actively flow most of the winter. During the summer the stream is nice for other reasons as well. It's refreshing and tranquil with the trickle of water, the shimmer of light, the flutter of birds, the croaking of frogs and the buzz of a healthy mix of insects. But, when there's no rain, to have a stream you have to pump the water and that takes energy. The solar pavilion taking shape. A true wood and steel hybrid structure. In an effort to make this project 100% green, the clients committed to a solar pump. I immediately suggested we create a solar pavilion to highlight the solar panels and pump rather than use traditional and less attractive pole mounting hardware. Of coarse the structure wanted to be sustainable too. Looking under the solar panels. The aluminum brackets are mounted to the wood mullions which are sealed with glazing tape to the crystalite and then screwed from below. No fasteners visible on top, save for four holes for the solar feet. Local steel work, local solar consulting, local wood from my salvage pile, low impact construction with sturdy steel and wood design I'll guarantee remains standing for longer than the life of the solar panels, makes this as sustainable as it can get! Solar pavilion nearing completion. Still waiting on the clamping system for locking the angle into position. 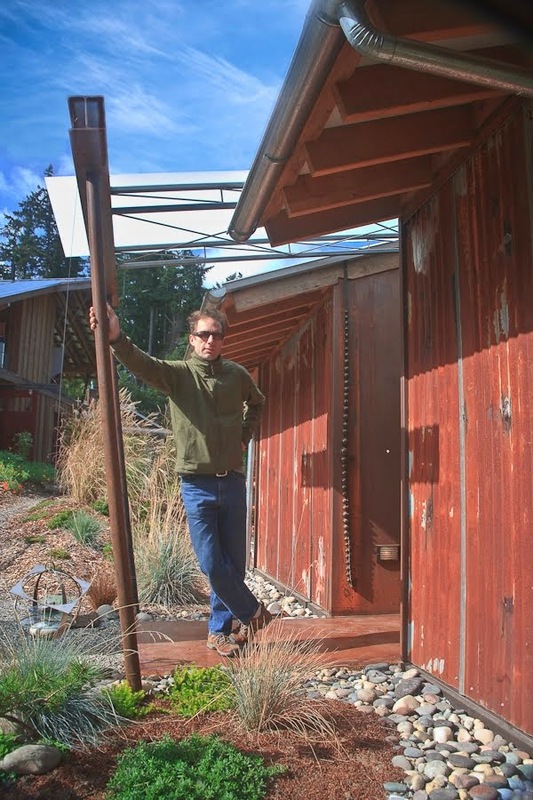 Solar components and system design by Whidbey Sun and Wind. Solar pavilion from below, creating an attractive usable space under the solar panels. Steel work by Irish Welding.